President Maithripala Sirisena has announced no deals will be signed during PM Modi's visit. 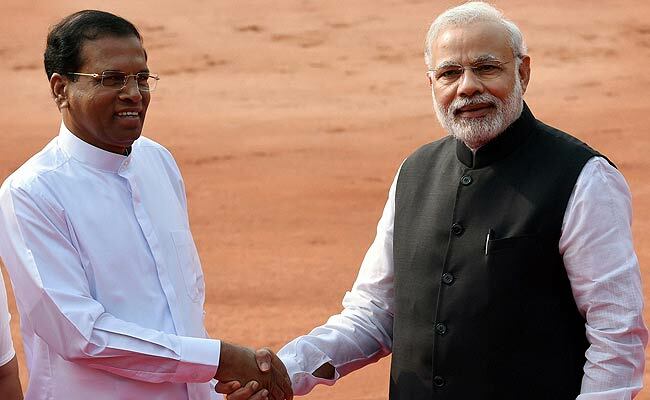 NEW DELHI: Prime Minister Narendra Modi will travel to Sri Lanka this week to join celebrations on Vesak, or Buddha Day, but no deals will be signed during the Indian leader's second visit in three years to the strategically-located island nation. Sri Lanka President Maithripala Sirisena has made the announcement amid an opposition campaign against the visit, playing on fears that India was keen to operate a World War II-vintage oil storage facility in Trincolamee port situated on the island's East Coast. Recently, former president Mahinda Rajapaksa who has accused Mr Sirisena of compromising the country's sovereignty, declared black flags would be shown to the visiting PM, something that did not go down very well with New Delhi. Here are the 10 points on the story. PM Modi will fly down to Colombo on May 11 to take part in the celebrations marking the UN 'Vesak Day' that commemorates the birth, enlightenment, and death of Buddha. The celebrations, a big event in the Buddhist-majority country, will be held in Colombo from 12 to 14 May. President Sirisena has invoked Lord Buddha to get the opposition to back down from its plan to show black flags to PM Modi. "Are they Buddhists?" Mr Sirisena asked, an attack on opposition leaders who called for protests during PM Modi's visit to the country for Buddha Day. The Sri Lankan President has announced that no pacts will be signed during the visit, rebutting a "disinformation" campaign "being spread on social media on the Indian premier's visit". Leading a joint opposition campaign against the visit has been Sri Lanka's former President who called a proposed deal with India to jointly operate a strategic oil facility as "betrayal" of Sri Lanka's national asset. "Trincomalee's oil tanks preserved as national asset by successive governments since Independence are to be sold. "They are trying to sell Sri Lanka to India," he said, remarks aimed at touching a raw nerve in a nation where the public is wary of India playing big brother. Apart from attending the Buddha Day celebrations, PM Modi's two-day visit is also expected to visit some Buddhist temples. It will also take him to Kandy in the island's Central Province which is famous for its tea gardens which has a large population of Indian-origin workers. Just last month, PM Modi had reviewed the implementation of decisions taken at high-level meetings during the last two years including his 2015 visit to Sri Lankan with visiting Prime Minister Ranil Wickremesinghe. At bilateral meetings during his visit, PM Modi is also expected to stress on humanitarian approach from Sri Lankan to Indian fishermen who venture into international waters. In March, India had accused Lankan Navy of killing a fisherman K Bristo from Tamil Nadu. Colombo had promised to inquire into the death but denied its Navy was involved. India is also among the top investors in Sri Lanka with accumulated investments of more than a billion dollars in the last 15 years. Investments worth US$ 1 billion are in the pipeline. Sri Lanka is India's second largest trade partner in South Asia, with annual trade of more than US$ 4.6 billion. Total trade between the two countries has increased 8 times since 2000 when they entered into a Free Trade Agreement.